ICStation mini stereo FM receiver module adopting advanced DSP and PLL technology ensure high quality boadcast signal receiving performance. 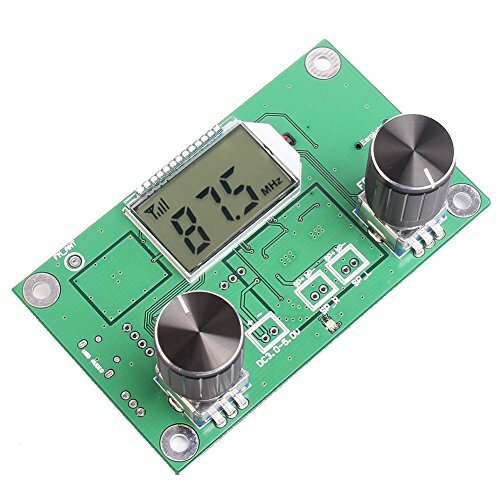 On-board 2X3W audio amplifier chip and support 30 class volume adjusting with blue backlight LCD display and potentiometer control easy to operation ideal for DIY FM wirless audio or short range wireless voice communication system. 1. Mute/Unmute: short press the VOL potentiometer to turn on/off the mute. 2. Auto-squelch: Long press the FRE potentiometer to turn on/off the auto-squelch and the LCD will display the corresponding on/off. Notice Please: the antenna can use the wire or the standard telescopic antenna. Fulfilled by Amazon will take 2-4 days delivery time and fulfilled by merchant will take 7-17 days delivery time usually. If you have any questions about this product by IS, contact us by completing and submitting the form below. If you are looking for a specif part number, please include it with your message.